When Japanese Imperial Army soldiers marched into Semarang, where Robert Rienstra lived, on the island of Java in what was then the Dutch East Indies, he was almost 10 years old. It was March 1942, and the Emperor’s forces were in their zenith, sweeping everything in the Far East before them. Robert’s father was a colonial agricultural administrator in the Dutch colony. His mother, who was part Dutch and part Indonesian, had died two years earlier at age 37 from pneumonia and fear. Her two oldest sons, Robert’s brothers, William and Paul, were in Holland attending school when Nazi troops occupied the country in 1940. She was literally frightened to death for her boys’ safety. In addition to being an agricultural specialist for the colonial government, his father was a member of the Dutch Naval Reserve. Hours after Pearl Harbor was bombed by the Japanese on Dec. 7, 1941, the Dutch East Indies declared war on Japan, a day or so before the United States took similar action. When his dad reported for naval duty, he left his young son with the boy’s aunt and uncle who lived in Semarang, a town in central Java. They had four children, three girls and a boy Robert’s age named Hans. It didn’t take long. The Japanese began to radically change how the Java government operated. “Hans and I were in the third or fourth grade. The Japanese immediately discontinued the school system,” he said. “Then they decreed all Dutch nationals and anyone else with ties to the Allies had to report to confinement camps. The rest of the family was taken into custody and put in a temporary barbed wire enclosure hours away from Hans’ home. It was there Robert witnessed one of the first of many atrocities committed by Japanese soldiers on Java during World War II. At the time he had no idea what was going on. “One day, while we were in the holding camp, I saw lots of trucks go by out front filled with bamboo baskets the natives used to transport pigs. Each basket had a man in it. I wondered what was going on. After the war the Japanese officer who ordered these soldiers caged and drowned was found guilty by an Australian court. He was executed. A few days later, Robert and Hans were sent to a concentration camp for boys and young men that the Japanese established in what had been a Catholic high school run by the Dominican order of nuns. It was in Semarang where Hans and his family lived. His mother and three sisters were sent to another concentration camp for women and children in the same town. The school, convent and church complex was surrounded by a high concrete wall. It was located on about an acre of land in the middle of town. Outside the wall, the Japanese erected a 12-foot barbed wire fence covered with woven bamboo so no one could see in or out of the complex. Between the wall and the barbed wire Japanese sentries walked guard. Some 2,000 male prisoners from age 10 to their early 20s were crammed into this very small enclosure. Each detainee was allotted a sleeping space on the floor of one of the buildings. It was a patch of floor about 2 feet wide and 5 feet long. For Robert and Hans, when they weren’t working, home was in what had been the chapel. The camp had a two-tier command structure. It was overseen by a Japanese soldier. However, the day-to-day operation was run by detainees indiscriminately chosen by the Japanese. Food, or the lack of it, was an all-consuming concern on a daily basis for every boy in the camp. “We were fed by the Japanese. In the morning we would get some tapioca mixed with corn kernels. We ate our noon meal in the fields where Hans and I worked, and it was usually better. It normally consisted of a sweet potato-like vegetable cooked with more corn. At night we got a tiny cup of rice, a coffee spoon full of vegetables and another coffee spoon of ‘surprise meat.’ Nobody knew where it came from or what it was,” Robert said. “If the Japanese determined one of the boys had committed an infraction, or if they ran out of wood to cook with, the whole camp got nothing,” he said. “We went hungry that day. “Once they locked us up in the concentration camp, the beast came out in the Japanese. They beat us with bamboo canes and kicked us. It’s difficult to put into words the terror we experienced in the camp. “There was an occasion where two boys snuck out of the camp to buy food outside. They were coming right back. Unfortunately for them, they were caught by police and turned over to the camp guards,” Robert said. Time and the world outside the confines of the camp meant nothing to Robert or any of the other captives. They had no idea what was happening in the Pacific war or any place else far from the camp. “Time for us was measured in increments of, ‘How long is this guy going to beat me? How long do I have to stand in group formation at night in the rain or in the blistering sun? That was time for us,” he said. Every kid in the camp had a particular job. Every morning Robert and Hans marched to the fields 45 minutes away with their hoes in hand. They would spend the day working in the hot sun tending radishes, lettuce and other vegetables. “At the end of day, when we returned to the camp, we would be searched to make sure we didn’t steal any vegetables. If our white field commander, who was the worst, found vegetables on you he would kick the living daylights out of you. Then he’d turn you over to the Japanese and they would beat you again,” he said. One of the worst incidents of his 2 1/2 year confinement happened shortly after they arrived. “The Japanese brought in a group of what we believe were American pilots they had shot down. They brutally interrogated them in front of us. It was so bad many of the kids couldn’t stand to watch what they did to them. “Before they were through torturing these aviators, they cracked their teeth. Then they made them wash their mouths out with pepper-water. After that they beheaded each one of them with a sword while we stood there watching. “I’ve looked everywhere, but I’ve never been able to find a history on this incident,” Robert recalled as he sat in his Punta Gorda home more than 60 years later. This story was first published in the Charlotte Sun newspaper, Port Charlotte, Fla.on Wednesday, Dec. 14, 2005 and is republished with permission. Tomorrow: Surviving the concentration camp at 10. Robert Rienstra, a 74-year-old Punta Gorda resident, spent several years as a prisoner in a Japanese concentration camp for young men and boys during World War II on the island of Java where he grew up. It was a painful experience he has only begun to talk about in recent years..
A former Catholic high school in Semarang, a town in central Java in what was then the Dutch East Indies, was converted by the Japanese into a concentration camp for young men. It became a hell on earth as the war got increasingly tough for the Emperor’s forces. Robert and his cousin, Hans, were sent to the camp in 1942 shortly after Japanese forces took control of island. For the next three years the two boys, who were both 10 years old at the time, used almost every waking hour trying to survive or tending the fields where much of the food the camp detainees ate was grown. Bedbugs were a constant curse for the 2,000 boys in the camp. They crawled over everything and everybody in the camp. Flies were another problem in the camp. They hadn’t been in the camp long when the Japanese sent in a thousand or so “old men,” in their 50s. They stayed by themselves, traded most of their food for tobacco and other thing and died off quickly. The worst job in the camp was to be assigned to tooth-collecting detail. When these older men died their bodies were stacked for a few days in what had been the chapel’s sacristy. “Just before they were buried the Japanese would select several boys at random. They would give them pliers and screw drivers and force them to knock out the gold teeth in the corpses and remove their gold or silver rings,” Robert said. “Of course rigor mortis had set in. We would have to break the corpses’ jaws to get to their teeth. If you didn’t come out of the sacristy with gold teeth in your hand the Japanese would beat you. Disease was a constant threat for all the prisoners. They were undernourished and lived in unsanitary, harsh conditions. He went to the camp infirmary run by Dr. Neuberger, a well-known local Hungarian physician. The doctor took a look at Robert and pronounced him reasonably fit. “The next day when I woke up I couldn’t move anything. The doctor had to open my eyelids for me and turn me over in bed. He suspected I had polio. “For the next three months I remained in his infirmary. He treated me with home remedies made from tree sap, bark, roots and leaves. He had no medicine. He didn’t even have medical tools to operate with. Robert had hardly recovered from his polio-like malady when he began to develop water edema. His arms and legs and other parts of his body started filling up with fluid and were two or three times the size they should be. Because they lacked vitamins, water edema was a relatively common ailment for the prisoners. It killed people regularly at the camp. “Then my kidneys stopped functioning and Dr. Neuberger put me on a strict diet of nothing but a quart of sugar-water daily,” he said. I wasn’t allowed to eat or drink nothing else. He was hoping to stimulate my kidneys and get them working again. Robert was on his last leg. He was so bloated by water the doctor was afraid that if he drank another glass of sugar-water he might drown his heart in his own body liquid. Robert survived the paralysis and the water edema and lived to work in the fields another day. While he was on the verge of death his cousin was having his own health problems. “Hans was suffering from hunger apathy. That’s a person who knows he needs to eat, but when he is provided with food he doesn’t eat it,” Robert explained. Hans came close to dying, but he, too, survived the ordeal. By this time in the war, time was running out for the Japanese. It also seemed to be running out for many of the boys in the camp. The lack of food was at the heart of their problem. Some time late in 1944 the boys finally got some packages from the American Red Cross. A package meant for two had to be shared by 20, after the Japanese stole the cigarettes and clothes in the boxes. The boys were still grateful for the Red Cross packages. A few months later, sometime in 1945, they started getting more food in the camp, but nobody knew why. The extra food was a problem, too. “One boy got hold of a bamboo container the Japanese used to carry butter. He died from eating too much butter,” Robert said. “Another boy ate too many hard-boiled eggs. He died from egg poisoning. “Then one day two Dutch B-25 bombers flew low over the camp and dropped a bunch of leaflets after wiggling their wings. The Japanese collected all the leaflets because they didn’t’ want us to read them. We knew something was up,” he said. “It wasn’t long after that the Japanese commander came in to see us in his full dress uniform. He was accompanied by all of his adjutants. They sat on a hastily built bamboo platform complete with a table and chairs,” Robert recalled. World War II was over for Robert Rienstra and hundreds of other teenagers in the camp. He was 14-years-old and hardly weighed 60 pounds. But he had his cousin, Hans who was also 14, and survived it all, too. What happened to Riensta after the war? Immediately after the surrender was announced Riensta’s aunt and her oldest daughter, Joyce, showed up at the boys’ camp in Semarang, Java, looking for him and his cousin Hans. All of them returned by train to Surabaya, Java, where Hans’ family lived before the war. When they reached home they discovered the Indonesian people were revolting against Dutch colonial rule. Their family was forced to flee because they were Dutch colonials. The family and Robert fled to the British colony at Singapore. Eventually Riensta and his adopted family moved to Amsterdam, Holland. It would be 1949 before he was reunited with his father in Holland. After completing school and a hitch in the Dutch army he came to the United States. To gain U. S. citizenship quicker Riensta joined the U.S. Air Force in the 1950s, after the Korean War, and was trained as a computer operator. 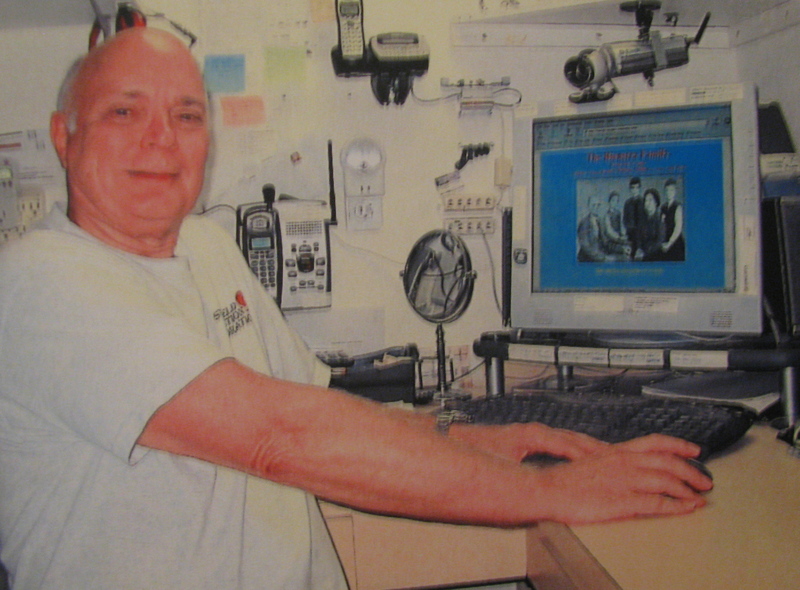 After getting out of the U. S. military he went to work for the federal government as a computer expert. After his retirement from the government Riensta and his wife, Deniece, moved to Punta Gorda in 1991. This story was first published in the Charlotte Sun newspaper, Port Charlotte, Fla. on Saturday, Dec. 17, 2005 and is republished with permission. Incredible random brutality by some Japanese soldiers on innocent young male civilians for no reason. Just wondering if Robert is still alive. His story is so similar to that of my fathers. His brother gave me the picture of the statue recently, and he told me that the statue was made from a photo taken of my father. Thank you Don. I have left him a message on facebook, patiently awaiting a reply. 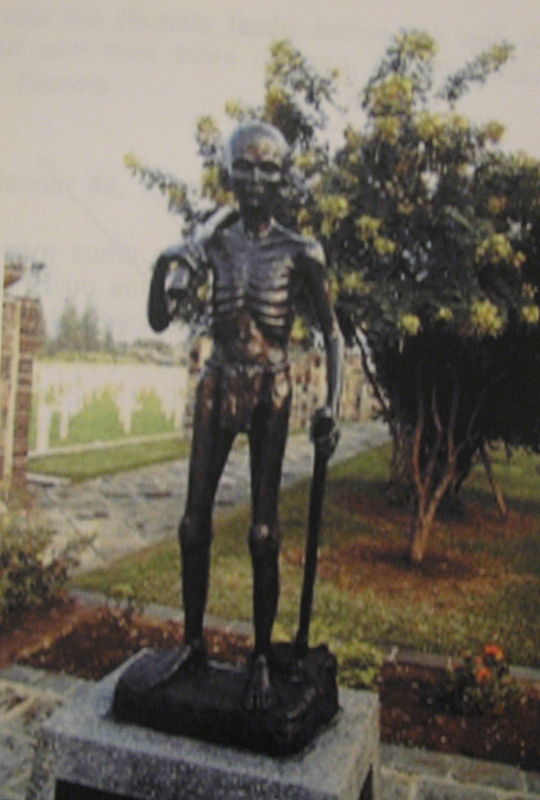 was the statue of the boy one of the boy-prisoners at Camp Bangkong? 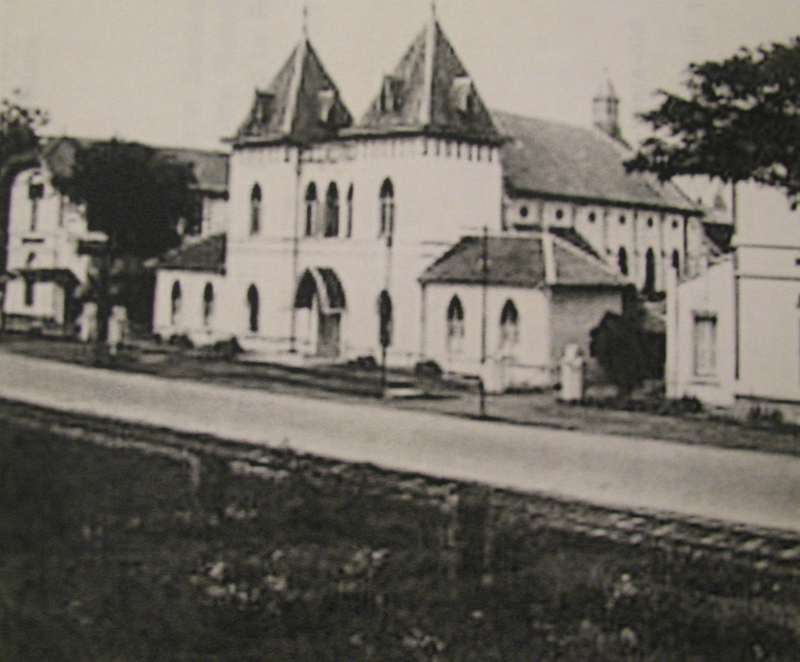 The photo of the Catholic church and school is the looks just the same as a photo a friend sent me of Camp Bangkong, where my brother was also imprisoner as a young boy. He survived, only just, but our father, who was transported there, died soon after arrival. It was a terrible place.